In today's affluent world, meaning and experiences are displacing products and services. As a consequence of the realization that our "stuff" is only a tiny part of what we desire, progress is now generated by intangibles such as happiness, goodwill, design, brand value and intellectual property. Human capital, not machines, are now the main contributor, so this new way of looking at and living life, requires a paradigm shift in how we create. Leading organizations understand the value of human capital and increasingly social/human and environmental aspects are included in the accounting metrics and annual reports. Somehow these metrics still seem to fall short in capturing the essence behind human value creation. What exactly is the value of someone being interdependent, helpful, positive, optimistic, realistic, proactive or even just dreaming big and having the guts to take risks? For starters, try imagining working with someone who embodies the opposite of these qualities. Human risk-attitude and behavior is also the key behind innovation. A recent study at Hanyang University in Seoul, South Korea compared the risk-profile of Asian and American graduate students and highlighted the value differences imbedded in the two cultures' risk attitude. Asians were found to be more comfortable with taking ethical shortcuts, gambling and incurring health/safety risks, whereas Americans were more comfortable with investment risk and social risk-taking. These findings reflect Asians willingness to bend the rules, as well as their ultra competitive nature and somewhat lax attitude towards their personal safety. Americans, on the other hand, have aggressive business expectations and a need to personally stand out and to be seen as unique. These differences dictate how Asians and Americans live life and conduct business and how they make the leap from a manufacturing or service economy to a Creative Economy. In a recent crowdsourcing challenge, we examined what constitutes American and Asian design. We found American design to be breakthrough, bold and stand out while Asian design was incremental, with fast-followers and subtler in their aesthetics. This seems to be slowly changing and their future cultural dynamics, risk-attitude and how these are applied in creating new offerings will determine their future competitive advantages. Twenty observed student projects in America and twenty projects in Korea over the past year, showed equal levels of creativity and working with hundreds of top-tier designers from all corners of the world over the past decades has convinced me that all seemed to be equally innovative. Therefore, the difference in the final outcome seems to be more culturally determined than related to differences within the individual designer. So, how does one increase the survival rate of innovative concepts, in a culture that favors incremental innovation as concepts filter though the organization and it's decision-making process? 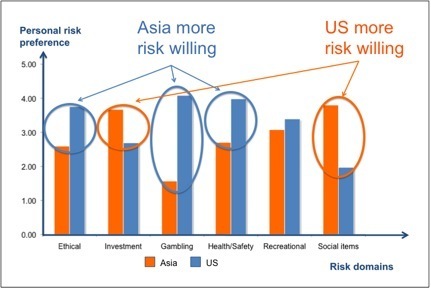 Studying the cultural risk-profiles suggests that one way to increase risk-taking in Asian corporate cultures is to reframe innovation as a gambling/betting endeavor as opposed to viewing it as an investment. By nature, incremental innovation, characterized by low market risk and low technology risk, lends itself to managing risk and return and historically accounting methods are aimed at supporting this path. Breakthrough innovation, on the other hand, is characterized by high market and high technology risk, making investment thinking nonsensical and lends itself better to gambling/betting thinking. Since Asians have an appetite for risk-averse attitudes in investment and risk-seeking attitudes in gambling, this paradigm shift represents a culturally inherent Asian competitive advantage, one that is extremely difficult for Westerners to copy. Who knows, in the future, the world could turn yet again and live to see the West becoming the fast followers.